Attention: Title applications will NOT be processed beginning 15 minutes prior to closing time. Manufactured homes 20 model years old or newer. Motor-driven cycles (including every motor scooter and every bicycle with motor attached) containing motors which do not exceed five brake horsepower nor exceed 150 cubic centimeter engine displacement and weighing less than 200 pounds fully equipped. Most applications for Alabama certificates of title cost $18. Motor vehicles, motorcycles, motor homes, travel and semi-trailers, all fall into this category. Manufactured home certificate of title applications cost $23 per side or section of the manufactured home. Those transactions include transfers of ownership, corrected titles, adding liens, etc. Replacement titles cost $18 each, unless application is made directly to the state for the replacement. There is no charge to remove a lienholder from a title. However, if the original title with the lien listed has been lost, a replacement title will have to be ordered, in which case a replacement title fee will be due. Please be aware that the requirements below are general, and that other documentation is sometimes required in order to process a title and/or registration. Every situation is different, and until all paperwork can be examined, there is no way to know whether or not any additional documentation is necessary. Some states send the valid original title to the owner, not to the lienholder. Persons registering vehicles from the following states must surrender their out-of-state titles in order to apply for Alabama titles: Kentucky, Maryland, Minnesota, Missouri, New Jersey, New York, Oklahoma and Wisconsin. Michigan, Montana, South Dakota and Wyoming give the vehicle owner the choice of having the title mailed to the owner or to the lienholder. Persons registering vehicles from these four states must either surrender the original title or provide proof that the original title was mailed to the lienholder. * The Next of Kin Form is available at the License Office. The form is also available online at http://www.revenue.alabama.gov/motorvehicle/mvforms/mvt5_6.pdf, and is titled Affidavit for Assignment of Title for a Vehicle From A Deceased Owner Whose Estate Does Not Require Probate. The Next of Kin form must be signed and notarized by the deceased person’s next of kin. Applications for replacement titles may be processed at any of the four Tuscaloosa County License Office locations for a cost of $18 each. 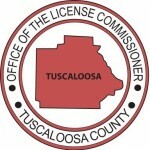 Vehicle owners may also apply directly to the Alabama Department of Revenue using the Application for Replacement Title (Form # MVT 12-1), which is available online under the Titles tab at http://www.revenue.alabama.gov/motorvehicle/forms.cfm. Simply fill out the Application for Replacement Title and return it along with payment to the address at the top of the application. Only certified funds are acceptable (money orders and cashiers checks); personal checks and cash will not be accepted. Please note that if the previously issued title had a lienholder listed, the replacement title will be mailed back to the lienholder unless the vehicle’s owner provides a lien release stating the lienholder’s interest in the vehicle has been paid in full. In cases where the vehicle is less than 12 model years old, a lien release will be required in order to remove the lienholder’s name from the title. However, in cases where the vehicle is 12 model years old or older, a lien can automatically be removed from the title if 4 years or more have passed from the recorded lien date. The liens for travel trailers and vehicles with a gross weight of 12,000 (including manufactured homes and motor homes) or more are not covered under the 12 year rule, and must generally have a lien release. Should you have any questions regarding titles, feel free to contact our Title Department at (205)464-8442.